This (long) posting provides guidelines for using common patterns to control concurrency when using relational databases (RDBMS) via ADO.NET or the .NET Entity Framework (EF). MS SQL Server and Oracle are used as examples to sensitize you for the implications of RDBMS specific concurrency model implementations. Concurrency control design decisions are very difficult to change once you are well into development (or even in production) because of the deep and complete design decisions and tests necessary. Part 2: Know your Database System! With this post I want to sum up my experience, thoughts and research about handling concurrency issues using the current .NET technologies. In case you disagree with my findings, thoughts or recommendations: your comments are welcome! Let me first give an overview of my general approach. Later I will explain the background of my recommendations and give detailed code examples for ADO.NET and EF. to improve performance in high-concurrency scenarios. Oracle has always used its optimistic multi-versioning. -- Enable SQL Server optimistic DB concurrency mode. to scope a set of business operations. to scope a set of database updates. Use explicit transactions in the data access layer. Use declarative transactions via Enterprise Services. I do not use Enterprise Service for new applications. Works with SQL Server 2008 and Oracle 11g R 1. See Avoid unwanted escalation to distributed (DTC) transactions. spanning multiple databases or WCF service calls. (DB, MSMQ, File System, Registry). Beware! The default isolation level of TransactionScope is Serializable, while the default in Oracle and SQL Server tools and via ADO.NET or EF is Read Committed. For using WS-Atomic transactions with services on different platforms like Java see Truly Understanding .NET Transactions and WCF Implementation. .NET does not support software transactional memory yet. The Entity Framework implements “Requires Transaction” for SaveChanges: it automatically creates a new Read Committed transaction around SaveChanges() if not executing in the scope of a transaction. Depending on the RDBMS concurrency mode and the isolation level chosen, transactions alone often do not meet the data consistency requirements. Ex: lost updates can occur under read committed, when transactions base updates on previously retrieved values (~ SELECT…UPDATE constructs). Even if transactions alone would meet all requirements, there are scenarios in most architectures where it is not feasible to use transactions for protecting a complete set of operations (Ex: web apps, Client/(stateless)Server apps, operation sets spanning user think-time). My default implementation for optimistic control uses a row version column (automatically incremented by the database) and throws a DBConcurrencyException if it has changed since reading the row. For optimistic control to work, all applications (and interactive changes via SQL tools!) must check the row version on update. My DB.RetryOnConflict(unitOfWork as Action) procedure encapsulates the retry logic and uses a random exponential back-off to avoid excessive retries and potential livelocks. 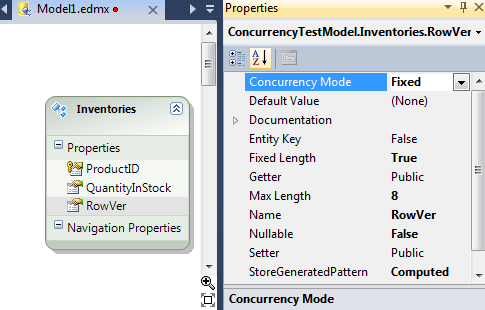 For details see see DB Concurrency Control with .NET -Details. Consider using pessimistic control, serializing SELECT…UPDATE constructs by locking, to avoid the overhead of rollbacks and retries needed with optimistic locking. The Entity Framework (in contrast to NHibernate) does not offer pessimistic locking – except by executing raw SQL. Consider using Check-out locking (~pessimistic offline lock) if neither holding DB Locks is a viable solution (because of user think time or a disconnected scenario) nor optimistic control (because losing all editing work is not acceptably for the victim of a conflict). Consider using SQL atomic operations, set-based operations and relative updates. Use atomic SQL statements instead of SELECT…(IF)…UPDATE constructs. ‘Only send an Email if we succeed in setting leave approval request state to ‘Reminded’. Solving the problem above in EF without using raw SQL is extremely cumbersome. Use relational set operations instead of procedural loops. Use relative updates (SET Price * 0.8). ‘Change prices using a relative update. 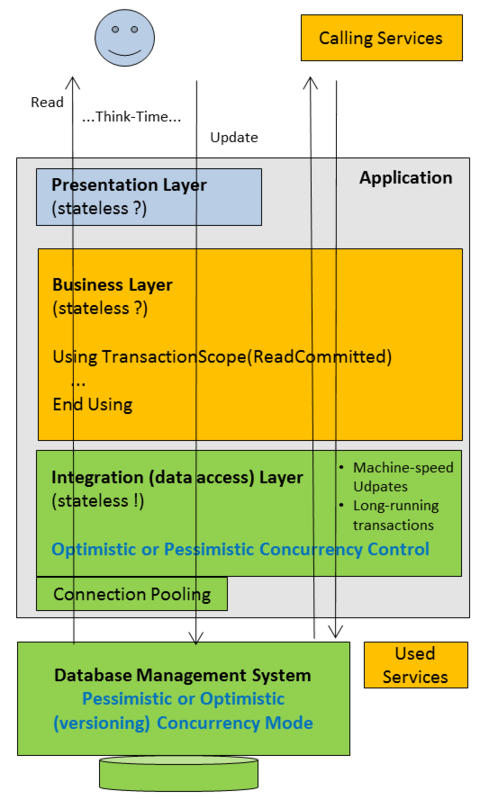 This entry was posted in Computers and Internet and tagged .NET, ADO.NET, Architecture, Client/Server, Database, Distributed_Apps, Entity_Framework, Oracle, SQL_Server, Transaction_Scope. Bookmark the permalink.